The race between Snapchat and Instagram might finally have a clear winner. Adweek recently announced that Instagram Stories, an Instagram feature considered to be in direct competition with Snapchat, now has 250 million daily active users—more than Snapchat’s entire user base. But even more impressive than Instagram’s number of daily users is the speed at which the app continues to grow compared to its competitor. According to Apptopia, Snapchat lost six percent of its daily users from May 2016 to May 2017. During that same stretch, Instagram grew its daily user count by 7.7 percent. Apptopia also reports shrinking Snapchat engagement and increased Instagram engagement. 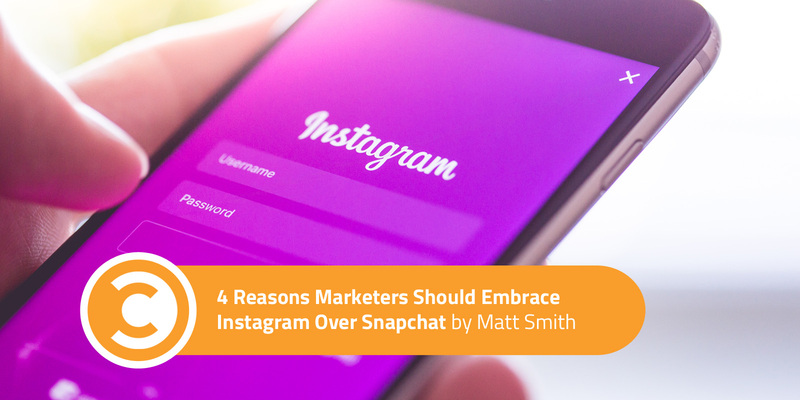 This suggests that Instagram—not Snapchat—is the platform of the future for marketers. The decline could be even worse than Snapchat is letting on. When Nick Cicero, CEO of creative studio and video analytics company Delmondo, had his company analyze 21,500 Snapchat Stories, the numbers it found are alarming: From August to November 2016, Snapchat saw a decrease of about 40 percent in the average unique viewers per Snapchat Story. Part of the reason for this decline is that Snapchat is focusing more on its role as a messaging app rather than an e-commerce channel for brands. Separate areas for brands and users provide a clean experience, but when publishers have limited time and budget to spend on social media engagement, Snapchat’s brand quarantine doesn’t provide the best return on investment. Instagram Stories might be the copycat, but the feature seems to have exceeded Snapchat’s version already. The feature uses the more discoverable background of the main Instagram platform and offers improved brand-focused features without segregating the social messaging and e-commerce aspects of the app. Instagram Stories gives users and marketers the best of both worlds—and users are responding. Mediakix reports that, as of August 2017, influencers were posting to Snapchat 33 percent less often. Meanwhile, those same influencers were posting 14 percent more often to Instagram Stories. If Snapchat is fine with letting influencers walk, marketers should have no problem heading out with them. Assuming Peretz’s story is true, Snapchat might actually be rooting for that to happen. Discoverability is the biggest differentiator for Instagram—and it’s the primary reason users are gravitating to the app. This, combined with smarter tools for marketers, means Instagram now provides a more viable channel for marketing. Below are four in-app reasons marketers should join the migration to Instagram Stories. Engagement remains king on Instagram Stories, just as it was on Snapchat. Instagram understands its marketing userbase and continues to add features that appeal to both consumers and brands, like Extended Stories. Extended Stories boosts engagement by allowing Instagram users to upload content from beyond the typical 24-hour window used by Instagram and Snapchat. This allows marketers to pull content created days earlier and post it to their main story. Although not out to the masses yet, a few lucky people are already playing with it, and early results are promising. For brands and influencers, more control over Stories equals more opportunities to boost engagement and strengthen marketing narratives. Instagram now allows e-commerce brands to link out to their products with links and buttons in posts and Stories. While this gives brands an easy way to drive conversions, consumers also love it: 72 percent of Instagram users claim to have purchased an item they saw on the platform. With 62 percent of Instagram users following brands they love on Instagram, it makes sense for marketers to monetize—either through the app itself or through useful tools that help create a more shoppable app experience. Snapchat has never been a friend to marketers in the analytics department. Instagram identified that opportunity to compete, and so far, the Facebook-owned platform is making the most of it. Snapchat forces influencers and marketers to check their story analytics and take screenshots to share their metrics with brands. Meanwhile, Instagram’s analytics tool, Instagram Insights, makes it easy for businesses and influencers to understand and manage their social engagements. Information like influencer follower demographics, impressions, clicks, and follower activity are all available through the provided tools. Marketers have come to expect this level of sophistication from their analytics. Thanks to Instagram, they finally have access to the kind of data that Snapchat has denied them for years. Ever since Instagram entered the Stories market, it’s had one giant advantage over Snapchat: Facebook. With the expansion of Canvas ad format to Stories, Instagram now has a new tool for marketers to use—one that is already wildly successful on Facebook. These full-screen ads load quickly, providing a seamless experience for users. They also give advertisers a chance to engage with users organically as they consume content. Other tools, like the Power Editor and Ads Manager, allow marketers to save and use Stories media in later campaigns. This streamlines the advertising process, making it easier for advertisers to leverage Instagram content across all Facebook-owned properties. It’s good for Facebook, good for marketers, and good for users. Everyone wins. Snapchat is still a key player in social media, but it likely won’t share that space with marketers for long. Instagram Stories are already better in every respect for engagement and analytics. Instagram is commited to keeping marketers on the Stories platform. Now is a great time to learn what the technology has to offer and start reaching an ever-growing user base. Matt Smith is the founder of Later, the No. 1 Instagram marketing platform to visually plan and schedule Instagram posts. Prior to Later, Matt founded several startups, including Thinkific, an online course platform helping thousands of people build businesses online.